When an event starts with a safety talk there’s a good possibility that things could go sideways. Sure enough, as soon as we passengers were educated in one hand for the ship etc., Captain Evans went on to explain that getting started on our sailing afternoon was not going to be as easy as we’d hoped. The wind was spanking out of the south, hitting the north facing Adventuress on the left flank and pinning her to the dock. 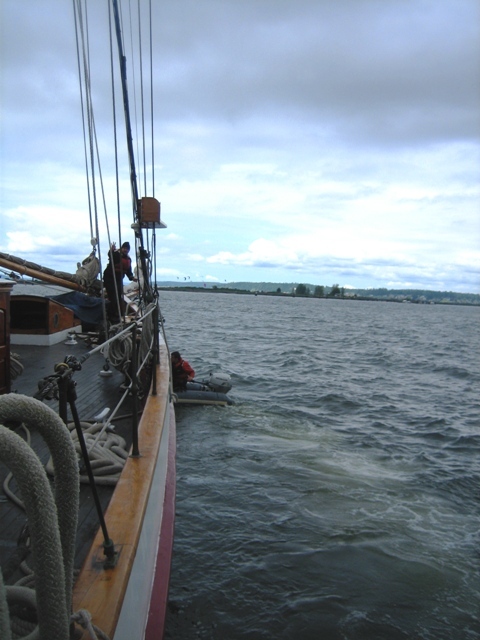 Fancy seamanship was needed to turn her around and head south toward the harbor mouth. A 1913 era bow thruster – otherwise known as a dinghy – upgraded with an outboard motor, was needed to push the bow away from the dock. Armed with fenders, the crew stood along the starboard rail to protect the hull in case the wind proved too much for the little tender. But the crew won the battle, executed the turn, and we were off, with the crewman in the dinghy in pursuit. 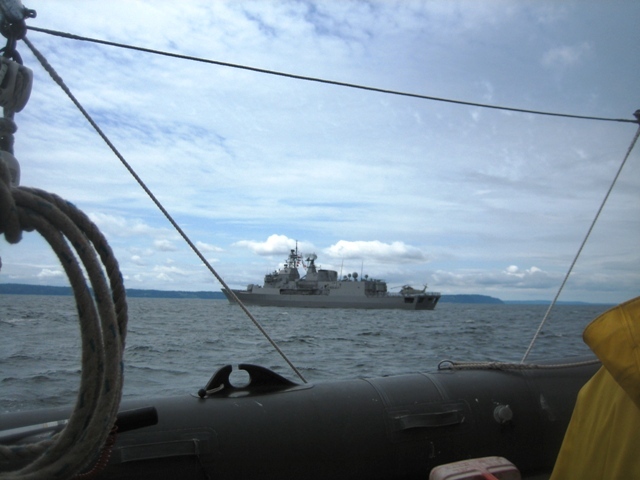 We motored down the channel, past the New Zealand Navy (!) 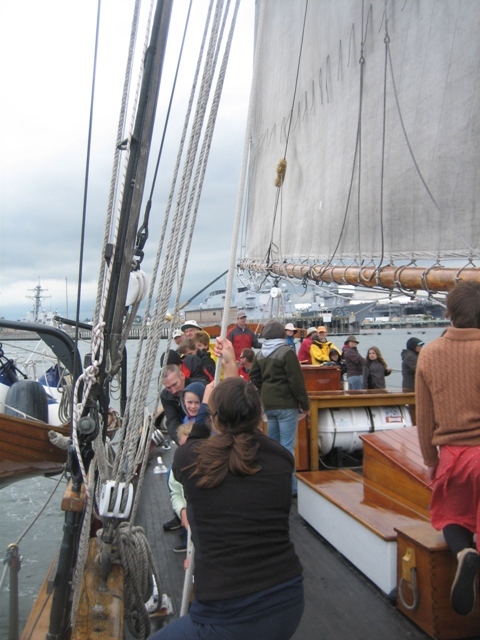 and into the open sound for the next lesson … how to raise a schooner’s sails. 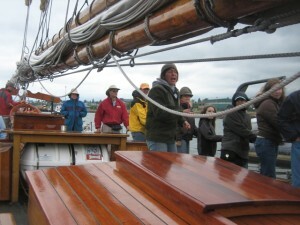 We also learned that Adventuress’ passengers do not sit around sipping margaritas while the crew does all the work. 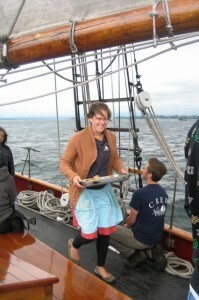 Chief Mate Sarah sprang into action rounding up two teams to hoist the main, which weighs as much as a small car. That’s actual canvas, not lightweight Dacron. The throat halyard team and the peak halyard team pulled alternately, raising one end of the sail and then the other, roused to greater effort by a shanty called Sailing Down to Cuba. After the sails were raised, crew member Cameron put me to work coiling a halyard, one of the lines used to hoist the sail. Adventuress’ halyards are very long and, once the sails are set, serve no other function and need to be out of the way. The coil Cameron taught me is called the Ballantine. It’s made of three overlapping circles and allows line to be stowed in a secure stack, neat and out of the way. In an urgent situation, when sails need to come down quickly, a Ballantine allows the line to pay out rapidly without fouling. I refused to guarantee that my somewhat misshapen Ballantine would be anti-fouling. For the next couple of hours we tacked back and forth between Everett and Hat Island with the Whidbey Island ferries in the distance. 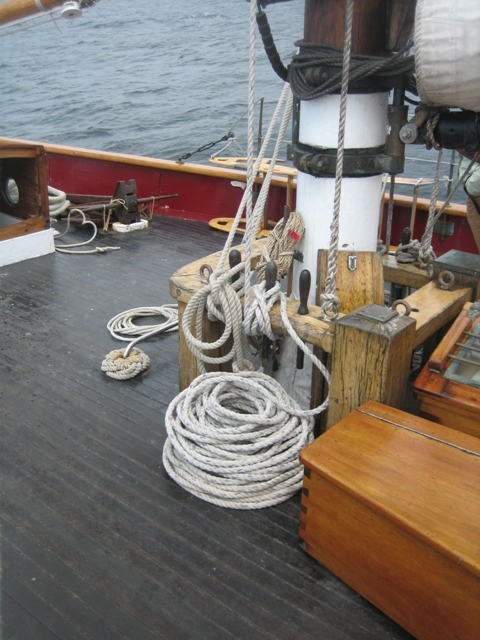 Now and then Captain Evans would say “Prepare to come about,” and Chief Mate Sarah would gather her crews again, this time to sit on the deck and haul on the jib sheet. She looked so serious and intent on her work that I was afraid to approach her and ask about her job for fear of distracting her attention from some vital task. When I did talk to her later and told her about my hesitation she laughed and said, “Yeah, I get a mate face.” Now I know what to call the intense frown I often wear when Tom and I sail Nameless. Later, watching Cameron standing on the foredeck waving her arms around I asked Zach what she was up to. While we were busy discussing the fine points of mariner’s lingo the sun came out to perfect our afternoon. The wind was brisk, now and then the bow spray flew, dousing passengers and making us feel like seasoned old salts. We toured the accommodations below deck and heard about the sailing and environmental programs Sound Experience puts on for school and community groups. As the afternoon drew to a close we came about one last time and headed back toward port. The chef appeared with a tray of vegan chocolate chunk cookies that surprised me by tasting great, even the bits between the chocolate. When it came time to drop sails, I put in my final crewing stint by helping with the downhaul, which meant pulling hard several times on a rope. I’m not sure what I did but our effort was apparently successful. I talked to crew members, office personnel, the captain, the chief mate, a couple of passengers and one Sound Experience member. Each had their own particular view of Adventuress and their involvement with her but they all agreed on one thing: the organization is absolutely phenomenal. Office staff and members said the crew is made up of sailors who are the cream of the crop. The crew praised the organization for building an absolutely first rate community on board the vessel. Volunteers told me about all the great things they’ve been able to learn and do since joining. Everyone was beyond enthusiastic about the job Sound Experience is doing with Adventuress as their main tool. Maybe it was those cookies. I have to add my voice to that chorus, the crew was professional and on the job, but patient and willing to take the time to teach and answer lots of questions. They made passengers feel welcome and never in the way. They smiled all afternoon – except Sarah, when she was intent on managing the sails, but she smiled the rest of the time. I think they like their jobs. Want to sail aboard Adventuress? Good idea. There are several opportunities. School groups can arrange trips of various length. 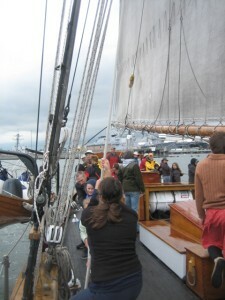 Public sails like the one I attended are scheduled 10 times per year. Adult, Teen and Family sails fora day or a weekend happen all summer. Intergenerational Sails for Grandparents and their spoilees ages 10 – 18 head off to the San Juan Islands three times this summer. Want to know how to become an Adventuress crew member? I know I do. Occasional volunteer crew are trained on the job during the regular season. Volunteer-crew must be members of Sound Experience and must fill out the Volunteer application and mail it to the Sound Experience office. 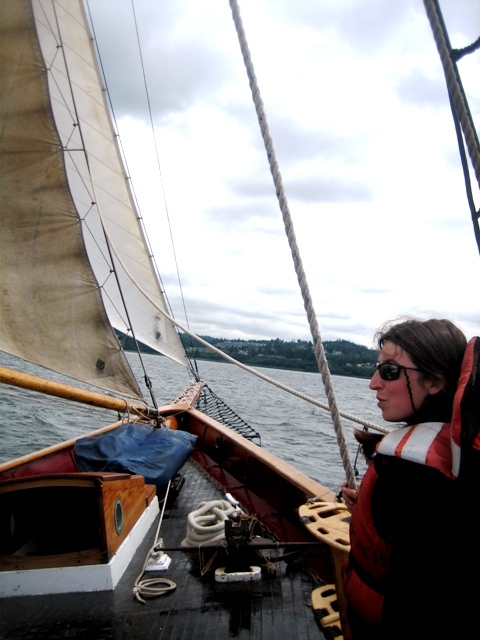 Want to be an Adventuress crew member? Professional crew must submit their application, resume and references each year. The application is posted in November for hiring the following year. Year-long volunteer crew are hired and trained once each year. Here’s the application to become a season-long crew volunteer. One last thing. Plans are underway for Adventuress’ 100th birthday party. To make sure you get the latest updates on the plans follow Adventuress on Twitter or Facebook. I recommend sailing on Adventuress early and often. Though with the supporters she’s got she should be sailing for another hundred years.